any? and any such historical information you may have. the "rock house" which is always quite easily seen. Standard reply sent to Marc. Email forwarded to MCHC members and others. until I went to the field to see what had drawn your attention. what sort of treasures might lurk inside the bowels of the old store. same for those reading this post that may not be familiar with the structure. 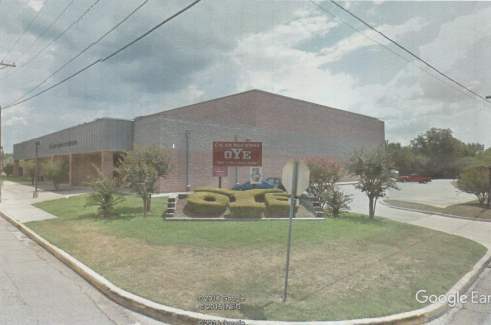 attachment showing YOE High School, it was located exactly where the shrubs are decoratively trimmed YOE. our most casual setting for everyone. Jeans and sneakers should be the dress code for the day. Be sure to look for a street sign with balloons on the highway. We look forward to seeing everyone at the June meeting. 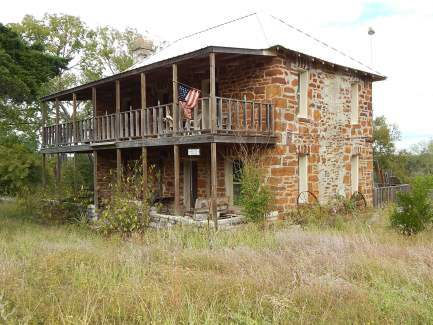 ROCK HOUSE.THIS IS THE FIRST OF CR LOOP 344. ABOUT ONE MILE MORE YOU WILL BE AT THE SECOND PART OF LOOP 344. GO A SHORT DISTANCE MORE AND YOU WILL SEE A LITTLE DIRT FARM ROAD..LOOK FOR SIGN AND ARROWS. those who had no cars and could walk a couple of blocks for groceries. It was a favorite place to hang out before school as we could hear the first bell ring. prominent family in Milam County. 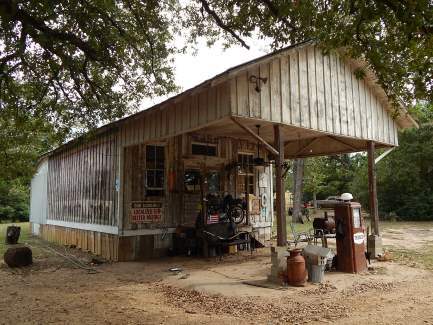 has been painted to read "Bob Turner Grocery", Bob being Lester's son who possibly ran it after his father. additional information that he may share. 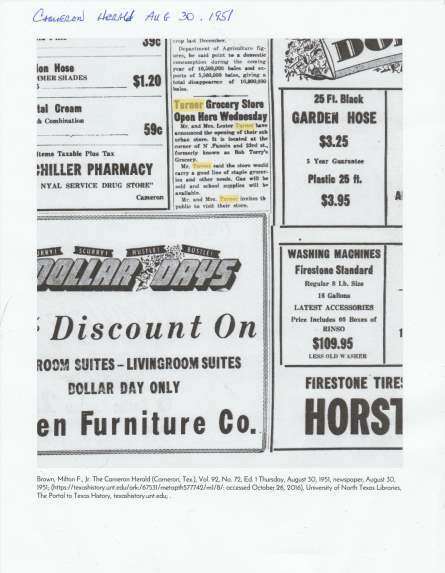 While researching the Cameron Herald newspaper archives through the Portals of Texas website I discovered the attached newspaper article with the header; Grocery Store Open here Wednesday. This article was dated August 3, 1951.The location is 11 blocks north of the Yoe High School location reported earlier and not far from the Airport in Cameron. 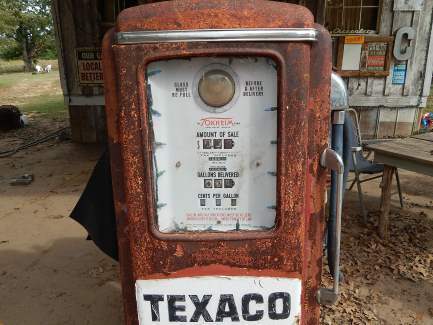 I discussed this with Ms.Mary Ann Eanes, Ms. Jane Monroe and Ms. Liz McDermott, all tenured and very knowledgeable members of the Milam County Museum and who also reside in Cameron. They have mixed memories of the 23rd St. store after 65 years. It was mentioned that many of Cameron's streets were renumbered over the years possibly causing some confusion. I then went back and zoomed into the front peak of the store and struggled to see how the very faded lettering actually read. I discerned it to read Bob Terry Grocery and not Turner at all. This now made some sense. Lester Turner purchased the business from Bob Terry as stated in the newspaper article. He never changed/ repainted the business name on the front of the store. Lester Turner had no son Bob. All of the ladies confirmed that this is the store that was once located near YOE High School. I'm unable to factually explain the N. Fannin and 23rd street business unless it was an additional store that Lester Turner also purchased from Bob Terry or the street numbers were changed during this period causing all the confusion. Lets go back to the location where the Turner Store was moved between the 1980's and approximately 2006. Ms. Mode stated that it was close to the O'Reilly Parts store and Anthony stated that it was used for storage during that time. With this information, I went to the Google Earth site which has a slider time line bar that allows different satellite photos over a time range. I believe that I may have identified the Turner store by location and timeline. 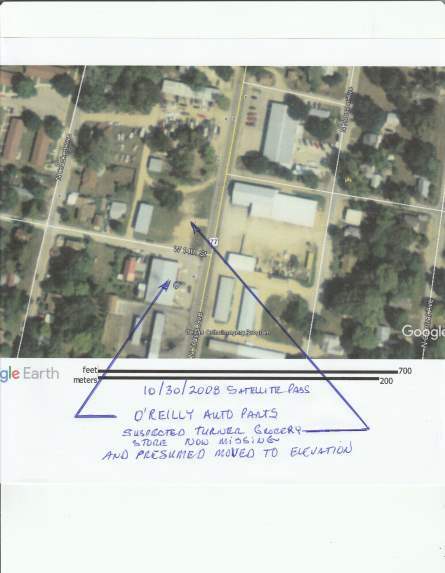 If you'll note the attachments, in the satellite pass of 1/26/1996, you'll see what I believe to be the Turner store north of O'Reilly's. Next the Satellite pass of 10/30/2008 it has been removed from that location. That would help confirm the earlier move around 2006. I am very thankful to have such helpful friends that share an interest in Milam County History. Thanks "guys" for assisting our MCHC website guest. I have a few more details to share with you regarding the store. Attachment # 1 is the view of the store via Google Earth Street View from Hwy 36, as you had previously observed. How you picked that out while driving, I'll never know. Attachment #2 are articles related to the Elevation Community of which you inquired. The upper was found in Tales From The Museum Volume #2, From the files of the Milam County Museum. Compiled and edited by Charles King- Milam County Museum. The book has no page numbers. 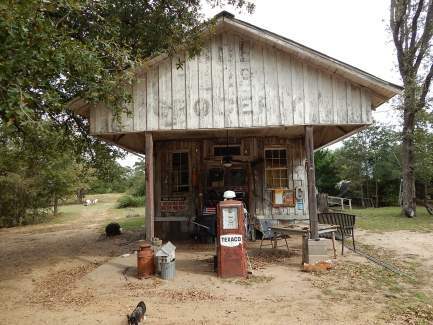 The lower article is from The History of Milam County, Texas, by Lelia M. Batte. Pages 163-164. Both of these books are available for sale at the Milam County Museum, Tel. # (254) 697-8963. I have not spoken with Marjorie Ann (Graham) Collins, the late Carter Collins' wife, about the store yet and haven't heard back from her son Anthony. The store and her home appear to be located on the same large tract of land. I would like to also confirm that her heritage is of the Graham heritage as mentioned in the above article. My attempt at an abstract type search of the store property to confirm earlier Shuffield ownership has not been successful to date. 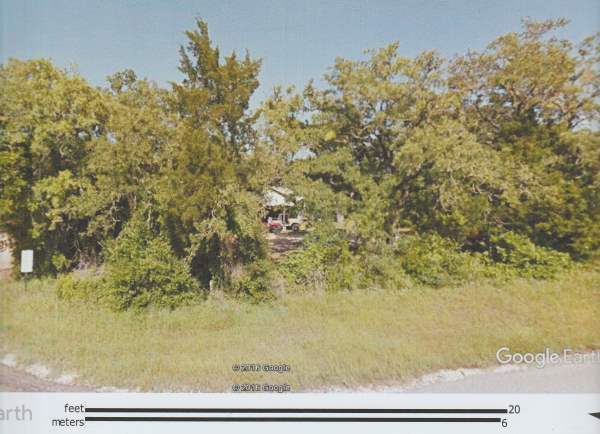 The original store property ID was collapsed into the Yoe High School property after it was purchased. It appears that Cameron ISD property is proprietary and therefore no Volume and page is shown on the Milam County Appraisal District (MCAD) website (at least publically available). 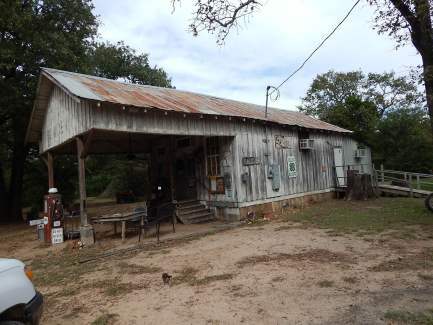 I'll visit the Milam County Clerk's office the first chance that I have and search the Volume that addresses the time frame dated Aug. 30, 1951 when Lester Turner purchased the store from Bob Terry. Ms. Jane Monroe, from the museum, was kind enough to speak with Mr. Bob Terry, grandson of the Bob Terry who once owned the store. Should you be familiar with Bob's Steakhouse in Cameron, that is his business. 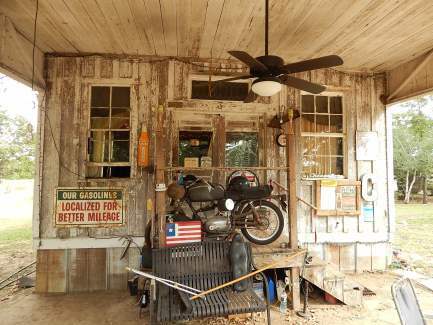 He firmly stated to Jane that his grandfather built the original store and not a Shuffield. Another conflict in information from two different individual that needs to be resolved. I'm hoping that the above title search will resolve the discrepancy.